The tax sale board June 13 in City Hall, showing two Belpointe Capital properties at top. Everyone David Mapley talks to in Norwalk is upset about the level of their taxation, he said Thursday. So Mapley started a new Facebook page: Norwalk Taxes Too High. The brand new page had six members Thursday and four posts, one of them the NoN story about the Norwalk Branch NAACP’s accusations of “gross fiscal irresponsibility” levied against Norwalk Superintendent of Schools Steven Adamowski. Another post on the new page is the NoN story about 2017 city employee salaries, topped by Adamowski at $254,998.92. Speaking of taxes, guess what’s been in the biennial tax sale? The list of properties at one point included three owned by Waypointe developers: one officially owned by Belpointe Capital and two under the legal entity, NW MFP Norwalk Town Center II LLC, for which Belpointe Capital serves as agent. Belpointe owed $88,670.37 for 467 West Ave., formerly referred to as Loehmann’s Plaza, and $66,650.69 for 17 Butler St., both of which are being readied for the construction of Waypointe Pinnacle. Those taxes were paid Thursday, according to the City website. Belpointe still owes $18,500.25 for 38 Orchard St., which is just down the road from the Pinnacle properties. Three Belpointe execs won $254 million in the lottery in 2011. The tax sale is July 23. 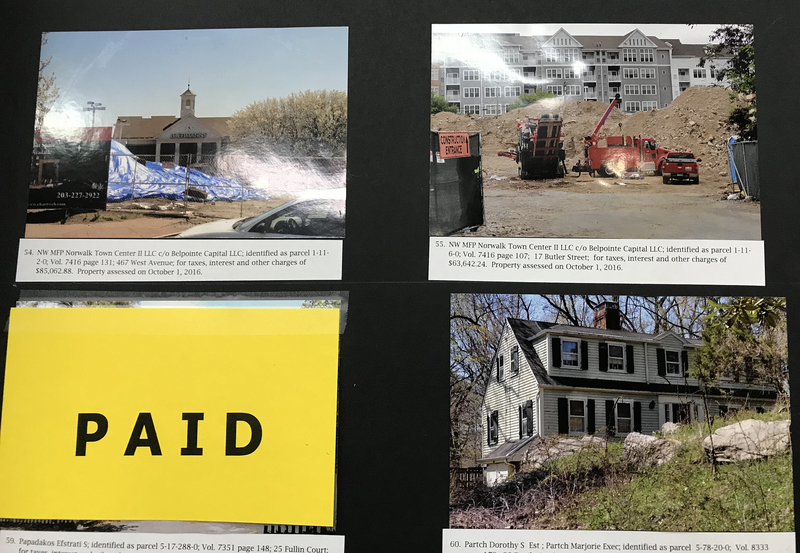 Many delinquent property owners have paid their taxes, removing their property from the sale and collectively paying the City more than $3.9 million, according to the city’s web site. There are 38 properties and 11 boat slips with unpaid taxes remaining in the sale, according to the site. Belpointe was also cited for a Zoning violation recently, for allegedly operating a contractor’s yard within a Central Business District. Neighbors provided evidence, with a Waypointe resident emailing Planning and Zoning Director Steven Kleppin to complain of noise before 7 a.m. Compliance Inspector Tammy Maldonado on May 8 wrote that she had been out on foot, trying to get a look at the property, when Scott Silk of Silk Plumbing told her that workers had been bringing in dirt and building a pile up along Quincy Street. The dirt looked fresh and damp and the pile was tall, she wrote, explaining that she attempted to inconspicuously take photos and video on foot, but caught the attention of a construction worker who yelled obscenities at her. Deputy Zoning Inspector John Hayducky on May 11 cited Belpointe with violating Norwalk Municipal Code 117-4 and gave the company 15 days to correct the violation. There would be a $150 a day fine if the violations were not corrected, he said. AMEC Carting has been doing the work. Photos on file in Planning and Zoning show a truck reportedly leaving the Pinnacle site and taking dirt to 41 Wolfpit Ave. The file includes bird’s eye views of Loehman’s demolition, with one photo dated 7:07 a.m., apparently from April 23. There is also a May 7 email from Silk, complaining of dust flying and rocks and debris coming onto his nearby property. Hayducky on June 13 said P&Z is watching the property and everything seemed to be in compliance. As long as the property remains in compliance, there will be no fines, he said. The value added tax (VAT; Mehrwertsteuer / Taxe sur la valeur ajoutée / Tassa sul valore aggiunto) is one of the (Swiss) Confederation’s principal sources of funding. It is levied at a rate of 7.7 percent on most commercial exchanges of goods and services. Certain exchanges, including those of foodstuffs, drugs, books and newspapers, are subject to a reduced VAT of 2.5 percent. Yet other exchanges, including those of medical, educational and cultural services, are tax-exempt; as are goods delivered and services provided abroad. The party providing the service or delivering the goods is liable for the payment of the VAT, but the tax is usually passed on to the customer as part of the price. In 2014 total revenue from VAT was nearly CHF 11 billion (short scale) on CHF 866 billion of taxable sales. In 2013 the revenue and sales were CHF 10.3 billion and 858 billion respectively. This assumes one actually wants to KNOW why Swiss property taxes are lower — most likely it was a rhetorical complaint in the form of a question. Why would a city inspector be concerned with having to inconspicuously take photos and video? It’s your job and, obviously, legal right to document potential violations. As for the construction worker, call and cop and have him arrested. Why are property taxes high in Norwalk? For starters, when city government desecrates residential property owners by allowing for commercial elder care facilities charging $6,000 per room, halfway homes and residential car wash facilities on residential streets – why would any prospective homeowner be attracted to a city that lacks common sense zoning and land use regulations? Harold same thing applied at Ryan park as day to day pictures were sent to the EPA announced the city was not pleased with what went on. Missing contaminated dirt from day st is still an issues for Tim he has yet to learn video and pictures at 5 am during one one of the moves were made. One person the city hired has never been on a haz mat waste site. This is where an attack on city hall was worth the wait. Many fed and state agencies not mentioned in any news articles on Ryan park have been on board for months bet that will ,make iy confusing for the city on the next spin. Property taxes across CT’s 169 towns and cities are among the highest in the nation. So too are salaries/benefits of municipal public Union workers. Nonetheless there are great variations in property taxes as a percent of the property’s appraised value. That reflects both the competence and qualifications of elected and appointed officials running local governments. Norwalk has a long tradition where there are no requirements for seeking elected public office. So anyone can become Mayor. And we have the taxes to prove it. No Norwalk Mayor in living Mayor had anywhere the qualifications to oversee the City budget. So its no surprise soft Union friendly hires run City Hall. Not Top Talent hired by professional search. Our BOE does better seeking Supts. But then matches salaries with surrounding towns having incomes 4 to 5 times higher. But with far less impressive results. As long as Norwalk competes salary wise with wealthy surrounding. Towns and requires no credentials for elected officials we’ll have very high tax rates. In a highly transient City where relatively few retire that seems acceptable to residents most of whom do not bother to vote in local elections. No Party has ever housed a candidate who promised lower taxes. Norwalk’s elected leaders have long sought business development to absorb taxes. But without success. We remain a commuter City where residential housing comprises 90% of the long stagnant Grand List. What is changing is the distribution of incomes with a growing inner core of lower incomes and poverty rate approaching 10% surrounded by higher income suburbs. Downtown development has boosted the rental residents from 30to 40% in recent years. Savvy residents understand the consequences of annual propoerty tax hikes in the 3 to 4% range. At 4% property taxes will increase about 50% bringing the median homeowner bill to almost $10,000. That’s more than the annual median mortgage payment at current levels. It doesn’t take an MBA to figure out that Norwalk’s already declining property values will continue to decline over the next decade accelerating the exodus of long time homeowners. Making the City ever more transient. What’s truly sad is that 3to 4 decades ago Norwalk was a very different City with appreciating property values, quite low City taxes and low paid City employees who mostly lived in the City. Several hundred local business owners were the difference. They took an active interest in how City Hall was governed. Common Council meetings oft had a 100 attendees. No one would ever call the feisty Common Council a mere “Rubber Stamp”. But our City leaders invited in Big Box and the rest is history. Watching a Council meeting nowadays is downright painful. Norwalk faces a ever tougher future. As does CT itself. Still not too late to avert a Bridgeport solution. The obvious first step is either hiring a Professional Manager as doe most small/median sized cities. Or elect a Mayor with the financial and management experience to quality for a overseeing a $400 million budget. Our politician parties won’t countenance the first and none of our well qualified residents will step forward. So we’ll likely be “managed” by former City employees far into the future. Readers who doubt Norwalk was really once well managed can look up the yearly Municipal Reviews produced by CPEC in Hartford which compared detailed outlays for CT’s 169 towns. Sadly CPEC lost its funding about 15 years ago. Or they can look up Municipal Finance in CT – the only historical analyses of municipal outlays across our 169 towns and cities that I authors for CPEC. Again its worth emphasizing that Norwalk was well reagaded as one of CT’s best managed towns. But its residents lost interest. Looking back when the Big Boxes we’re invited to Route 1 the forecasts from hundreds of our small town local owned businesses that Big Box would forever change Norwalk were absolutely correct. Those who see a bright future for Norwalk ought ask why no Party ever offered a candidate promising lower City taxes. Public and private managers worthy of the name do that day in day out. As long as we elect Mayor incapable of reducing outlays we know our future morphing into the City east of us. In another decade all those who remember the Old Norwalk will be long gone. Back then it really was true that Norwalk was indeed one of CT’s Greatest Cities. All it really took was several hundred residents, mostly small business owners, who really cared about keeping the costs of City government affordable.